I need our paper hander-outer to hand back assignments. Let's make it a great day! HOMEWORK: Finish your Twitter Feed Project (due by tonight in Google Classroom). TEAM TRAILBLAZER AWARDS - Have you voted yet? If not, VOTE HERE. PRESENTING TWITTER PROJECTS ON TUESDAY - there will be no final exam on Tuesday; in its place we will have optional Twitter Project presentations. The presentation cannot hurt your grade--it can only help improve it!! Please consider sharing your work with us! I strongly suggest using Google Drawings. I finished my a TEMPLATE HERE. Open it, then go to File > Make a Copy OR you can create a copy on paper as well. Want to use the proper Twitter blue? It's called Steel Blue, and the color code is #319bc2. Ask Mr. Ippolito how to do this if you don't know what to do with it. Formatting, colors, etc. don't need to be perfect. Just make sure you include all the information required in the INSTRUCTIONS HERE. Always respond using complete sentences except when given different instructions. BLOG POST #1 - What was the most interesting thing you learned about the Black Death? What are looking forward to learning about between now and the end of the school year? 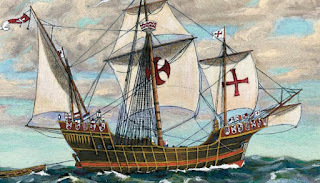 BLOG POST #2 - What do you think of when you hear the word "Renaissance"? Your blog post must include one image that relates to The Renaissance. BLOG POST #3 - According to John Green, what are three things we should know about the Renaissance (HINT: you could talk about art, trade in Italy, dyeing wool, money, alum mining, Muslim scholars, the Ottomans, heliocentric solar system, and did the Renaissance even happen)? Reference a time code in the YouTube video where John Green says the most interesting thing, and embed the video into your blog post. 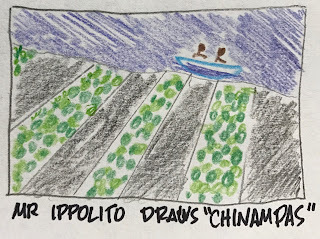 BLOG POST #4 - Renaissance art is known for its Realism. Look at Jan van Eyck's Portrait of Giovanni Arnolfini and His Wife (1434). Really look at it up close. Examine every detail. Create a numbered list of FIVE details that look incredibly realistic. After your list, explain what is your favorite element of the painting. In your opinion, is there any part of the painting that does NOT look realistic to you? Include a close-up screen capture of your favorite element of the painting. BLOG POST #5 - Good grief! Why are there so many naked people in Renaissance art versus Medieval art? How did cultural attitudes change in the Renaissance and why do you see so many more naked people? What is the difference in how Adam and Eve are portrayed in Medieval vs. Renaissance art? 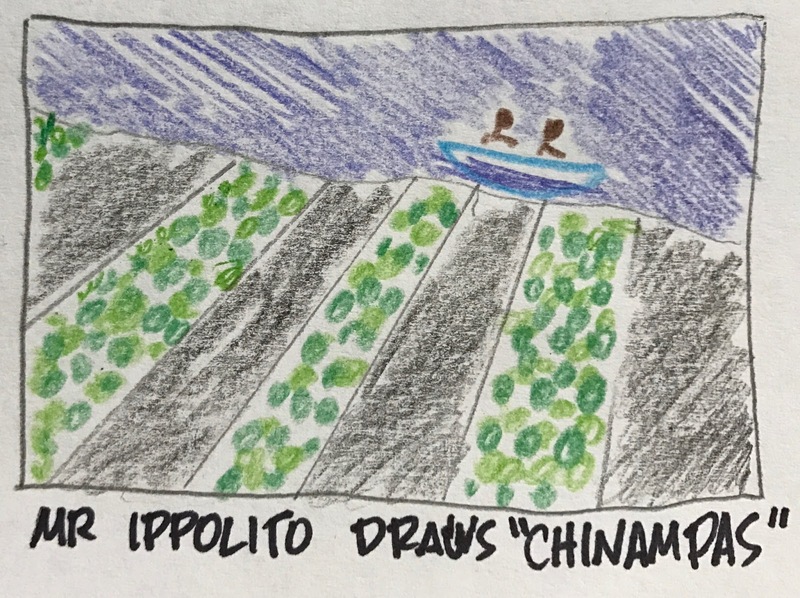 BLOG POST #7 - How does linear perspective work? In groups of 1, 2, or 3, create a 30-second video to demonstrate linear perspective and insert it into a Google Slides slideshow. Then embed that slideshow into today's blog post. BLOG POST #8 - Check out all the pieces of art in the "Selected Works of the Renaissance" I have curated for you. Choose one piece of art and learn more about it independently. Read the article about the artist and the specific work of art. Then answer these questions in your blog post: Q1: Which piece of art did you choose and who is the artist? Q2: According to your research and observations, why do you believe the artist created this work? Q3: It is said that "the best Renaissance art has the power to speak to people across time." In what ways does this piece speak to you, some 500 years after it was created? If this piece of art could talk, what would it say? Q4: What is the most interesting or thought-provoking image of the piece? Take a screenshot and share in a paragraph of 3-5 sentences why this particular part of the art is interesting. BLOG POST #9 - Think of the things that could use improvement here at Sierra Vista. What's not working quite right? In what ways could our school be better? Discuss with a partner, then make a list of ten things you think could be better here at school. We will use these to build a "protest list" later this week. BLOG POST #10 - Read the passage from The Hawk That Dare Not Hunt by Day on pages 510-511 in the textbook. Then answer this prompt: "The narrator and his uncle have already faced great danger in bringing Tyndale's Bibles into England. Think about the future dangers they might face. Then, write a short sequel to the scene. Tell what could happen when the narrator and his uncle try to bring the Bibles into London." Your short sequel should be a minimum of two paragraphs. 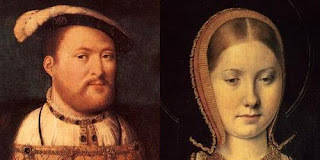 BLOG POST #11 - Read "Letter from Catherine of Aragon to King Henry VIII" and answer the discussion questions using complete sentences (discussion questions are in the letter). ASSIGNMENT 11.5 - This one is on paper. 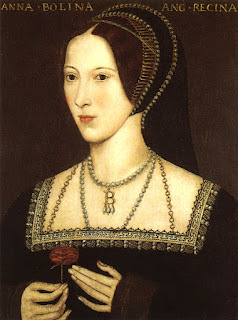 Discovering Anne Boleyn. Watch the first 18 minutes of this video then answer the questions. 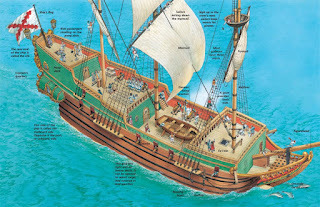 BLOG POST #12 - In your opinion, what motivated King Henry VIII to act the way he did? Was his behavior justified? Who's story is more tragic: Catherine of Aragon or Anne Boleyn? Why? BLOG POST #13 - Read and discuss each of the nine quotes from Queen Elizabeth I (from the 5/12 lesson). Determine the meaning of each of these quotes, and then think of which of these nine quotes is most interesting to you. Then start your blog post like this: I think Quote #____ from Queen Elizabeth I is the most interesting because . . . HOMEWORK: Prepare for Blog check (to happen some time this week). FINAL EXAM UPDATE - there will be no final exam on Tuesday; in its place we will have optional Twitter Project presentations. The presentation cannot hurt your grade--it can only help improve it!! Please consider sharing your work with us! HOMEWORK: Twitter Feed Project due by Wednesday. HOMEWORK: Read 19:1 and 19:2. Prepare for possible (open-note) reading quiz TOMORROW. HOMEWORK: Prepare for Blog check (11-13) tomorrow. HOMEWORK: Read 19:1 and 19:2. Prepare for possible (open-note) reading quiz on Wednesday. 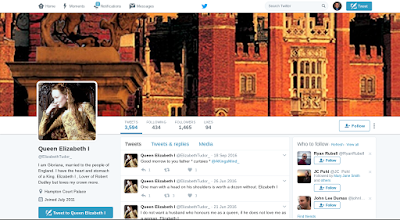 TWITTER FEED PROJECT for a Historical Figure - Directions and Setup. 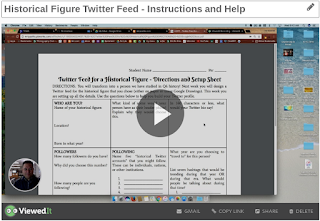 Watch the video below to hear more instructions about how to complete the Twitter Project Setup Sheet. Now that you have done all your research, you are ready to create your page. I strongly suggest using Google Drawings. I have started creating a template HERE. Open it, then go to File > Make a Copy OR you can create a copy on paper as well. Include all the information you have researched in your Twitter feed using the example in the images above. HOMEWORK: Get all your work done by the time Mr. Ippolito returns on Monday. PLEASE HELP: Let's make sure the Chromebooks get returned and plugged in at the end of each day. That's B PERIOD on Wednesday and C PERIOD on Thursday. Thanks! SEATING CHART - The seating is set up in rows for the CAASPP testing. You will sit by your Chromebook number for these three days. You do NOT need to create the actual Twitter page this week. I just want you to do all the research, planning, and setup this week. I will work with you next week to actually create the "Twitter page." And of course, as I mentioned in class, this is just a simulated Twitter page. There is no need to sign up for real Twitter. BLOG POSTS #11-13 - Finished your Twitter feed setup and research? Then make sure all your blog posts are up-to-date. Directions to all blog posts are below. Plan on having a check for Blog posts #11-13 when I return. FIVE POINTS - each term has been used in a sentence that demonstrates you know the meaning of the word. ALL DONE WITH EVERYTHING??? - If you are truly all done with everything, you can do work from another class, read your SRC book, or get an early start on next week's reading: 19:1 and 19:2. We will have a reading quiz (probably our last of the year) next Wednesday. You may want to take notes, because (for old times' sake), our reading quiz will be open-note. REMINDER: Plainsman Progress Day today. Come after school to make-up work. HOMEWORK: Be up-to-date through Blog Post #13. Take home your ETCTW artifact. HOMEWORK: Finish your Mesoamerica vocabulary AND your Twitter feed for a historical figure setup sheet (we got this in class on Tuesday, 5/16) this week. HOMEWORK: Be up-to-date through Blog Post #13. Be prepared for a blog check tomorrow. HOMEWORK: Take home your ETCTW artifact this week. HOMEWORK: Mesoamerica vocabulary. Due Wednesday. 2. What and where is Mesoamerica? HOMEWORK: Be up-to-date through Blog Post #13. Be prepared for a blog check on Tuesday, 5/16. ALSO, make a plan to take home your ETCTW artifact next week. 1. Wrap-Up from yesterday--what questions do you have? What did we miss from yesterday's discussion? 3. 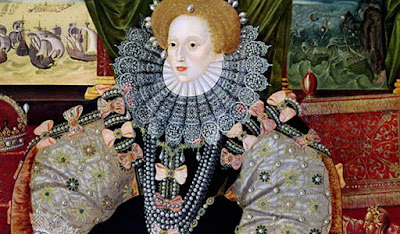 Blog Post #13 - Quotes from Queen Elizabeth I: read and discuss each of the nine quotes from Queen Elizabeth I (from the 5/12 lesson). Determine the meaning of each of these quotes, and then think of which of these nine quotes is most interesting to you. Then start your blog post like this: I think Quote #____ from Queen Elizabeth I is the most interesting because . . . HOMEWORK: Finish Blog Post #12. 1. Check out the Tudor Family Tree - it can definitely help to sort out all of the Tudor family craziness! 4. BLOG POST #12 - In your opinion, what motivated King Henry VIII to act the way he did? Was his behavior justified? Why would six different women want to marry him, and why did so many more want to be with him? Based on what you've learned, whose story is more tragic: Catherine of Aragon or Anne Boleyn? Why? BLOG POST #11 - Read "Letter from Catherine of Aragon to King Henry VIII" and answer the discussion questions using complete sentences. HOMEWORK: Make sure you are all caught up through Blog Post #11. 2. Watch the first 18:05 of "Henry and Anne: The Lovers Who Changed History"
1. Today is a catch-up day--a great opportunity to catch up on any blog posts you may be behind on. If you would like to resubmit the first blog grade sheet, you can find that in Box #10 in the cubbies in front of my desk. For the SECOND blog grade sheet, go to Box #11.